The rise of Rebel Rebel to their position as one of the UK's most exciting florists is a story of thrills and spills, and, as all good stories, started with a touch of romance: a bouquet sent to Mairead Curtin by her boyfriend. As Mairead admired it with her great friend Athena Duncan, they casually discussed what fun it must be to work with flowers: it couldn't be too difficult, surely?! Two years later, equipped only with a few days' floristry instruction at the Jane Packer and Paula Pryke flower schools and a packed florist's tool-kit (a gift from a friend), Mairead and Athena took on their first commission. The brief was to provide flowers for over 90 tables at a prestigious Restaurant Awards at Grosvenor House, sponsored by Carlton TV. They raided New Covent Garden Flower Market first, but, having underestimated quantities, ended up plundering neighbours' gardens and the stalls of Colombia Road. Friends and family were drafted in to help, and finally the completed table centres were placed under a canopy in the garden only to be ravaged by garden snails overnight! While lesser mortals would have been deterred by such a traumatic start, Mairead and Athena seemed to have relished the experience. "In a way it was good fun to not know what we were doing," explains Athena. "We didn't try to copy what others were doing – mainly because we couldn't - so we had to look at things in a different way." And so Rebel Rebel was born. Initially, Rebel Rebel was a pure event company working with Channel 4 and the BBC, clients who were on the look-out for new, exciting and innovative ideas. 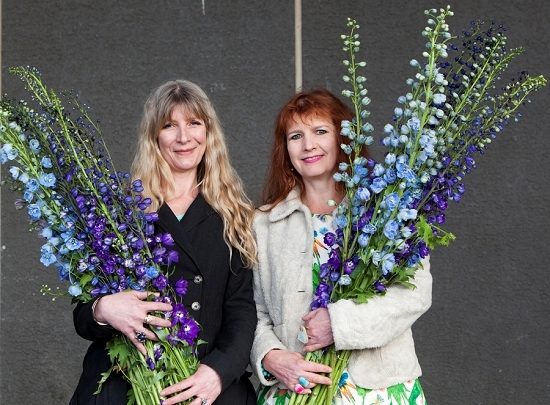 Mairead and Athena then opened a flower shop in London’s trendy Broadway Market, fulfilling their dream of a life surrounded by the flowers that inspire and motivate them. The business has since gone from strength to strength. The flower shop is thriving, the wedding business is buoyant and Rebel Rebel stage flowers for events such as the BAFTAs, are called on by stylists for designs like their floral Big Brother Eye, and have won a Silver-Gilt medal with their design for Kelway Plants at the centenary RHS Chelsea Flower Show. So, can they remember back to when they first entered the hallowed doors of New Covent Garden Flower Market? "I can actually," affirms Athena. "I was a student with Paula Pryke's Flower School, and I loved it from the start. I still get a thrill whatever the season. On a busy day there is such an abundance of flowers, herbs and foliage." Today, Rebel Rebel are known for the naturalistic style of their designs. "I think that happens as you get to know and to love the product," says Athena. "You start to use flowers in more natural shapes." See what happened when we let Rebel Rebel loose with their favourite British-grown flower, the delphinium, here. British-grown flowers are an increasingly important part of their portfolio. 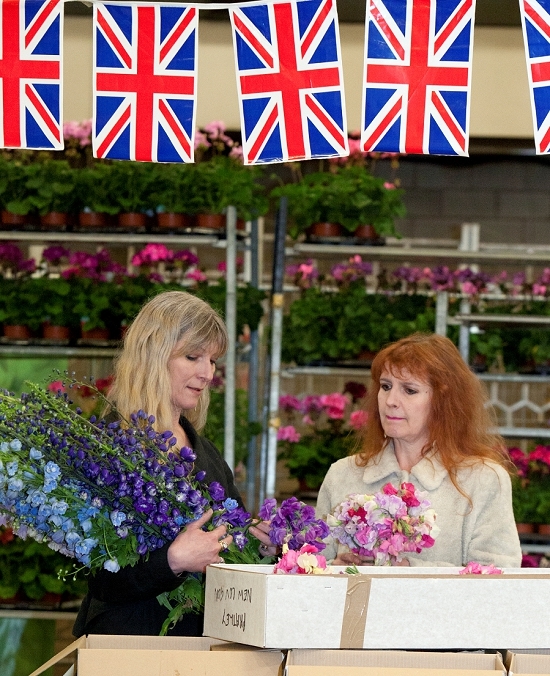 "We have a lot of demand from customers for British flowers. People in our area are very environmentally aware, and lots of our brides and customers are happy to give us a free rein on the flowers as long as they are British-grown." Consequently, the desire to buy British flowers, foliage and plants plays a big part in Rebel Rebel's daily sourcing at New Covent Garden Flower Market. They don't buy anywhere else. So who do they seek out? "We are pretty promiscuous," laughs Mairead. "We buy all over the Flower Market, from Bloomfield, Dennis Edwards Flowers, DG Wholesale, everyone really. "Pratley have the biggest range of British flowers. Mick Waite operates a mainly first come, first served basis so you do need to be there early. We have worked on our relationship with Pratley, and can sometimes pre-order with them now! "Edwin of Dennis Edwards Flowers is a great source of stocks and cornflowers. Zest has the most amazing sweet peas, and Alagar have stunning dahlias in season." Rebel Rebel are great fans of British-grown delphiniums, and have chosen them to be their focus flower for British Flower Week. Learn more about the dramatic spires of the delphinium here.